There are many luxury hotel brands, and hotel that purport to be 5-star properties. But in this crowded space, a few companies stand out for the quality of experience they offer guests, both their hard product and soft product. Are they perfect? No, but on the occasions when something goes amiss, they tend to provide better service recovery more consistently than other luxury hotel brands I work with. Aman Resorts started with Amanpuri, in Thailand, and is still particularly known for its resorts in Asia, particularly remote places such as Amanpulo, a private island in the Philippines, Amanwana, a scuba diver’s paradise in Moyo Island, Indonesia, and Amanjiwo, near UNESCO World Heritage site Borobudur. With the exception of Aman Tokyo, the company’s first urban Aman, each Aman Resort has fewer than 45 suites or stand alone villas, and in many cases fewer than 35. This means a far more boutique and personal experience than most luxury hotels offer, yet still with incredible amenities, from private beach clubs to scuba diving to private dining to superb spas to cultural experiences and private guides. Cheval Blanc is the luxury resort arm of Louis Vuitton, and is named for the prestigious Chateau Cheval Blanc winery in St. Emilion, which LVMH bought in 1998. So far it has just 3 properties, Cheval Blanc Courchevel, a luxury ski resort; Cheval Blanc Randheli in the Maldives; and Cheval Blanc St-Barth Isle de France in St. Barts, which is rebuilding following Hurricane Irma. For luxury travelers who insist on the best cuisine as well as beautiful design, no matter how remote the location, Cheval Blanc is ideal. In the 6 resorts we’ve visited in the Maldives, Cheval Blanc Randheli offered not only the most luxurious villa, with a private pool we could swim laps in, but by far the best cuisine, which was Michelin star worthy. Four Seasons has many more hotels and resorts than the others on this list, but what sets it apart from some other large luxury hotel chains is innovation and service. Four Seasons pioneered residential style luxury, combining exquisite rooms and suites with home-like comforts and understated, modern elegance. Founder Isadore Sharp focused on not only what business travelers would need for a productive stay, but on what would provide them the comforts of home while on the road, such as bath products and toiletries, which previous hotels hadn’t provided guests. Four Seasons was also among the first to cater to families seeking a luxury stay, developing a complimentary Kids for All Seasons kids’ club at its resorts, and special family-friendly features at all its hotels and resorts, from complimentary extra beds for kids and kids’ menus to baby amenities and family pools at many of its resorts. More recently, Four Seasons became the only luxury hotel to customize its bed, offering guests the choice of a firm mattress topper or plush mattress topper in lieu of its signature Four Seasons mattress topper. Four Seasons also has some of the top staff and manager training in the industry, which leads to longer staff tenure and higher quality guest service. Oetker Collection encompasses 10 properties, primarily in Europe, but also in the Caribbean, Brazil and Seychelles. Le Bristol Paris, one of the most well known properties in the Oetker Collection, is one of the elite Paris palace hotels. From its beautiful garden courtyard in the heart of Paris and indoor yacht-themed swimming pool with a view of Montmartre and the Eiffel Tower to 3-Michelin star Le Bristol and anticipatory service, the hotel embodies the first class experience Oetker Collection hotels seek to provide each guest. Over 4800 miles away, another iconic Oetker Collection property, Fregate Island Private, is a jewel even among its competitor luxury Seychelles resorts. With just 16 residences, each with its own private pool, you’ll often feel as if you’re the only ones in this paradise of 7 gorgeous private beaches, free roaming Giant Aldabra Tortoises, and Creole and international dishes prepared from organic fruits and vegetables grown right on the island. Activities include superb snorkeling and diving, fishing, sailing, kayaking, nature walks with the resident conservationists, stargazing, hiking, and spa treatments. The Peninsula Hotels’ original hotel is The Peninsula Hong Kong, and the company currently has 10 hotels, primarily in Asia, with 3 in the U.S. and one in Europe, The Peninsula Paris. While not as well known as some larger luxury hotel brands, The Peninsula is known for its guest-centric, intuitive technology, from its interactive bedside tablets that offer 11 languages and full control over the room’s mood lighting, curtains, temperature, privacy options, personalized streaming TV, music, room service and other hotel services. Internet is complimentary in all guest rooms, as are VOIP international phone calls. In fact, The Peninsula is the only hotel company in the world to have its own Research and Technology Department to design and build customized technology to serve its guests, rather than using off-the-shelf solutions. Ultimately what matters most for any luxury hotel brand, however, is the people and level of service, and The Peninsula excels in service, from excellent reservations service (I almost never have to wait when calling The Peninsula Reservations line) to front desk and concierge assistance, housekeeping and room service. 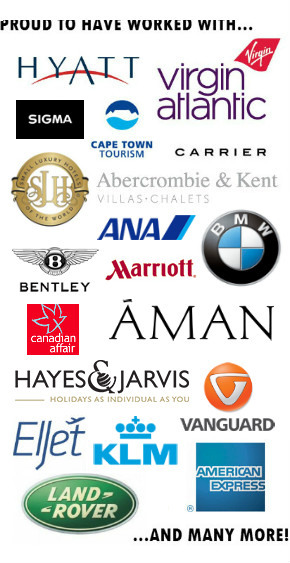 What are your favorite hotel brands and companies? Cuisine is possibly the most important thing for me when choosing a luxury hotel, so Cheval Blanc intrigues me. I’ve heard incredibly good things about dining there and about the levels of luxury. The only one of these I have stayed at was Four Seasons. It was a great experience and every time I have stayed at a Four Seasons the staff have been amazing. All of these places look incredible! In particular I really want to stay at the Cheval Blanc. The cuisine and remote location just sound perfect. The four seasons would also be an amazing place to stay. I love all these suggestions.